Our good friend and former teaching colleague, Bill Deering, was in London with a Visual Communications study abroad group when our exhibition opened at The British Library. We asked Bill to ask the students to shoot a ’selfie’ of them with the exhibition and we would offer our favorite the chance to work with us on 1 of our Tour de Lead Graffiti posters. We had David Jones, Bill Roberts, Jill, Tray, and I to help us choose the best ones. In the end we thought we would offer it to 4 that our group liked the best. These were our top 4 in no particular order. We liked that Chris Miello picked a heavy print to balance on his head. 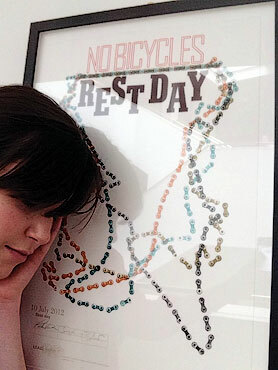 Krista Adams took the opportunity to take a break with one of our "rest day" broadsides. 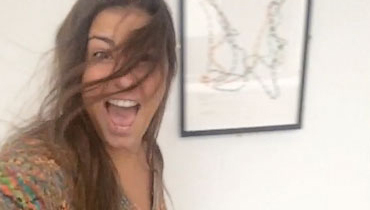 Olivia Prinzi did a nice, slow motion video (really nice hair) of her running through the exhibition. We especially liked the idea that she was RUNNING through the exhibition. We’ll see what The British Library thinks after I send the the link to this entry. The four students were offered Stage 14 on Saturday, July 19 for the broadside.